The quickly changing environment and weather during the autumn season present a variety of challenges for drivers. Sharp declines in temperature can result in mixed precipitation, black ice, and snow. 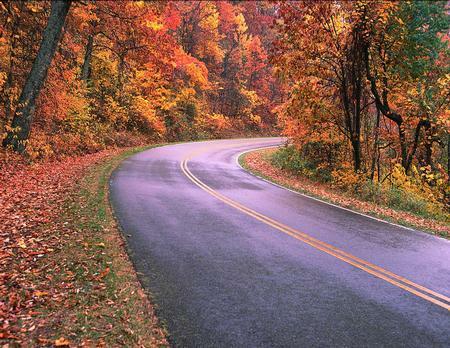 An abundance of falling leaves makes driving surfaces slippery. Extreme sun glare in the mornings and evenings makes it difficult to see clearly. To drive defensively during this season of transition, it is important that your vehicle is adequately prepared for driving conditions; that you are aware of the weather and animal hazards related to the season; and that you understand the correlation between reaction time and braking distance when unexpected hazards present themselves. Being prepared prior to getting out on the road is the first step to safe driving. Prior to operating the vehicle, conduct a pre-trip walk-around inspection; checking tire pressure, fluid levels, headlights, brake lights and signal lights to ensure that they are inflated to proper levels, and in good, working condition. Also, make sure that your vehicle is equipped with functioning wiper blades and that the wiper arms are exerting enough pressure on the blades to ensure a clean sweep of the windshield. If wiper blades are worn or damaged, replace them immediately. In addition to the walk-around survey, be sure to make adjustments to mirrors, seats and/or the radio before you begin driving and never while driving. Adjusting controls while driving distracts you from paying attention to events that are occurring on the road. And no matter what the season, always wear your seatbelt when operating or riding in a motor vehicle. This also applies to passengers riding in the back seat(s) of the vehicle. When wet weather conditions are present, always slow down and leave enough room around your vehicle to create a cushion of safety. Remember that stopping on a wet road can take up to four times the normal distance as on a dry road. When road surfaces are wet, watch for the presence of standing water in the roadway. When water stands or puddles on the pavement, it lifts oils and other fluids from the road causing slick spots, which increase the chance for your vehicle to skid. Excessive water can also cause your vehicle to hydroplane, which means that your tires “surf” on a film of water like a skier. Sudden, heavy downpours, driving too fast or driving on worn tires also increases your chances of hydroplaning. If the vehicle begins to hydroplane, do not brake or turn suddenly. These actions could put the car into a skid. Instead, ease your foot off the gas until the car slows down and you feel the wheels connect with the surface of the road. If you must apply the brakes in this situation, light, gentle pumping actions will be effective. If the vehicle has anti-lock brakes, brake normally and hold your foot firmly on the brake pedal so that the vehicle’s computer mimics a pumping action. On cold, wet days, look for ice in shady spots along the roadway. Because ice forms easily in these conditions, these areas are often the first to freeze and the last to dry out. Slow down and watch for ice on bridges and overpasses. These apparatuses often have icy spots even when the rest of the roadway is relatively dry. Because bridges and overpasses are suspended above ground-level, they are not insulated from the heat generated by the ground and are subject to direct contact with cold temperatures and wind. In temperature conditions of around 32 degrees Fahrenheit, ice can often become wet, which then causes it to be more slippery than at colder temperatures. Be aware of the danger posed by “black ice,” which is a thin coat of glazed ice present on top of the road’s surface. Black ice is nearly transparent—making it a hazard that drivers cannot see. Always reduce your speed when temperatures are cold and the risk of icy conditions is present. An abundance of wet leaves on the roadway can be just as dangerous as ice. Slow down and use caution when leaves are present on the roadway. Leaf accumulations are often found near sidewalks and stormwater drains. · Be aware that drivers may slow down suddenly or stop. Another driving hazard to be aware of is fog. Fog dramatically decreases visibility and can leave roadway surfaces wet and slick. In foggy conditions, slow down, increase your following distance and leave a cushion of safety around your vehicle. Most fog-related traffic fatalities occur because the driver is unable to perceive hazards present in front of the vehicle and when these hazards suddenly appear, they aren’t able to react in time. Slowing down the vehicle allows you additional time to safely react to unexpected conditions. Using your headlights correctly is another important technique for driving safely in fog. Always turn on headlights and use the low-beam setting. When conditions are foggy, the high beam headlights are not effective because they direct light up into the fog making it more difficult to see ahead of you. Using the low beam setting directs light down onto the road, making your vehicle more visible to other drivers. Remember that in foggy conditions, other drivers also have limited visibility. To increase your visibility to other drivers, use your turn signals early and brake with plenty of notice. In addition, keep your windows clear by using the windshield wipers and turning on the defroster. If you leave the roadway due to foggy conditions, pull off completely, turn off the headlights, and turn on the hazard lights so that other motorists can see your vehicle. Recent statistics show that most of the people who are injured or killed in deer-related collisions were not wearing their seatbelts. No matter what the season, always wear your seatbelt. The peak season for deer movement is during the months of October through December. This is called the “rut” or deer mating season. One of the greatest hazards of the deer mating season is that deer become less cautious about darting into and across roads. · When traveling at night, if there is no oncoming traffic, use your high-beam headlights to increase your night vision. · Be particularly attentive for deer between sunset and midnight, and during the hours shortly before and after sunrise. These times are typically when deer are the most active. · Drive carefully in areas known to have high deer populations and be extra cautious in areas where roads divide agricultural fields from forestland. Look for road signs that mark deer crossing zones and avoid using your cell phone or other devices when traveling in these zones. · Scan the road ahead of you to give yourself additional time to react to unsafe conditions. If you see a deer, slow down and be prepared to stop. Also, keep in mind that when you see one deer, there are probably others nearby. Deer often travel in small groups forming a single-file line. · If a deer enters the road or the lane you are traveling in, brake firmly and stay in your lane. Though your immediate reaction may be to swerve out of the way, some of the most serious crashes occur when drivers swerve out of their lane. Swerving to avoid striking a deer increases the risk of hitting another vehicle or losing control of your vehicle. · Another technique to use when encountering a deer on the roadway is to flash your headlights from bright to dim or honk your horn to encourage the deer to move on. · If your vehicle strikes a deer or if a deer is blocking the road, don’t get out of your vehicle and touch the animal—it may still be alive and could possibly injure you. Call the police for assistance. · Finally, when driving in zones heavily populated with deer, don’t rely on devices such as deer whistles, deer fences or reflectors to deter them. Relying on these items often gives drivers a false sense of security, which results in them letting down their guard and not paying close attention to their surroundings. As a defensive driver, an important concept to understand is the correlation between reaction time and braking distance. The physics that contribute to a driver reacting to a situation, applying the brakes and bringing the vehicle to a complete stop play a significant role in preventing collisions. Reaction time is the time it takes you to recognize the need to stop or maneuver the vehicle. The average person’s reaction time is approximately 3/4 of a second if they are paying attention. Braking distance includes a variety of factors such as the condition of the road surface; dry, wet or icy, plus the condition of the vehicle’s brakes and tires; proper inflation and good treads and how many passengers or additional weight the vehicle is transporting. The formula for how fast a vehicle will stop equals reaction time + braking distance. For example, at 60 mph a vehicle travels 88 feet per second. It takes 3/4 of a second to perceive the danger and another 3/4 to react and apply the brakes. In these 1.5 seconds, you have traveled 132 feet and the vehicle is still going 60 mph. Once you apply the brakes there is a .27 second lag before the brakes actually engage for a total of 1.77 seconds before the brakes are engaged. This equals a distance of 155 feet in which the vehicle has traveled during the perception and reaction phase of the stopping process. The autumn months are a beautiful time of transition and change. Before getting out on the road, be sure that your vehicle is prepared to meet the various weather conditions and exposures associated with this season. Along with being a defensive driver, practice being a thoughtful driver by adjusting your driving habits in accordance with the road and weather conditions and eliminating the temptation to focus on distractions, both inside and outside of the vehicle. Keep your eyes on the road, leave your cell phone in your bag and no matter what the season, always wear your seatbelt. This entry was posted in Lehigh Valley, Uncategorized on November 14, 2017 by aps.